Integral Options Cafe: RSA - What Kind of Love Do We Need? This is a video/talk from The RSA's series on reconceptualizing spirituality for the 21st Century. Previously in the series, they have looked at what it might mean to 'take spirituality seriously', the role of the body in spiritual experience, what sense can be made of the soul in a scientific age, and the importance of reflecting on our mortality. 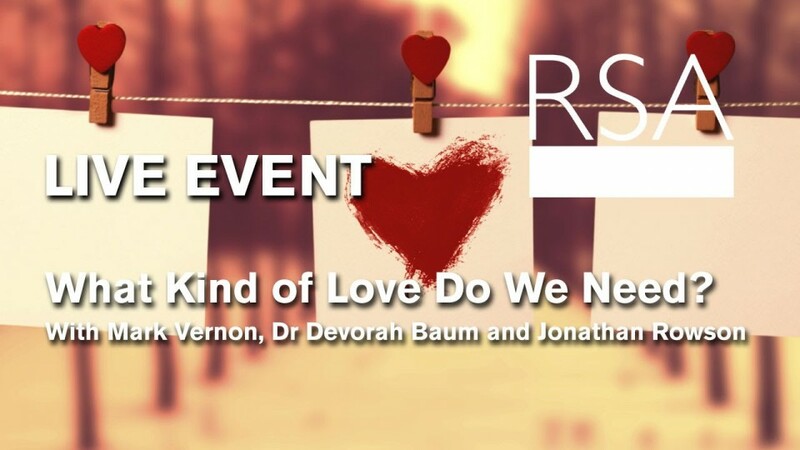 In this penultimate event in this series, Simon May, Devorah Baum, Mark Vernon, moderator Jonathan Rowson examine an experience and ideal that many believe has to be at the heart of any reappraisal of the spiritual: Love. All you need is love, said the Beatles, but is that right? And if it is, what kind of love do we need? Popular culture is awash with the excitement and drama of romantic love, but psychology, philosophy and other forms of inquiry reveal a much richer, broader, deeper and sometimes challenging notion of love. For instance, many believe the global reach of Christianity is related to the central importance it places on love, but Simon May has written that we have inverted 'God is Love' to create a world in which 'Love is God'. Are we now, in what Rowan Williams recently called a Post-Christian Society, still striving for a certain kind of love? And if so, what might it feel like to find it? In this series on reconceiving spirituality, we have explored what it might mean to 'take spirituality seriously', the role of the body in spiritual experience, what sense we can make of the soul in a scientific age, and the importance of reflecting on our mortality. Join us for the penultimate event in this series, when we examine an experience and ideal that many believe has to be at the heart of any reappraisal of the spiritual: Love. Dr Devorah Baum, lecturer in English, University of Southampton. Chair: Jonathan Rowson, director, RSA Social Brain Centre.